Boynton Beach Beach, FL —September 6, 2010 — CCTV Camera Pros, manufacturer and distributor of security cameras and video surveillance systems, is proud to announce the availability of the new DPRO-AS700 vandal dome camera with WDR (wide dynamic range) capability. The AS700 is part of CCTV Camera Pros new “Ultra Low Lux” series of CCTV cameras which are capable of operating at 0.00004 LUX light levels without using the built in infrared LEDs. With the infrared LEDs on, the AS700 can see in zero darkness up to 90 feet. The DPRO-AS700 is uses the new Sony 1/3" Super HAD CCD II image sensor also features advanced built in software controlled by an on screen display menu which gives installers advanced controls over the cameras light sensitivity settings, exposure, white balance, day/night, digital noise reduction, color, and sharpness adjustments. 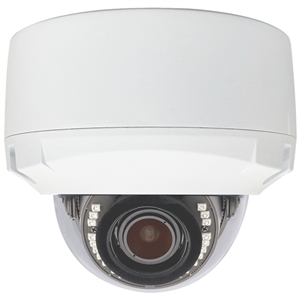 This new dome CCTV camera model is equipped with a 2.8-12mm varifocal lens which gives security installers a large focal range to adjust the field of view of the image. Commenting on the DPRO-AS700 release, CCTV Camera Pros co-founder and managing partner Mike Haldas says: “The BIPRO-S600VF12 and BIPRO-S700VF50 Ultra Low Lux cameras have been an amazing success. Surveillance installers can not believe how well these cameras work low light environments without even using the infrared LEDs. We are excited now to offer the same high end quality of the Ultra Low Lux series in a vandal dome style camera. Our installation partners are going to be happy to hear that we now have the power of the Ultra Low Lux series available in a vandal-proof dome camera housing. CCTV Camera Pros is a manufacturer and distributor of security cameras and video surveillance systems for home, business and government use. We are a veteran owned small business founded by a United States Marine. CCTV Camera Pros has a complete portfolio of products including, security cameras, digital video recorders, monitors, cables, connectors, and all accessories needed for a complete video surveillance systems. CCTV Camera Pros can help design systems for any size application. CCTV Camera Pros is partnered with a network of over 400 installers in the United States to provide surveillance system installation to all areas of the USA. Please visit www.cctvcamerapros.com.